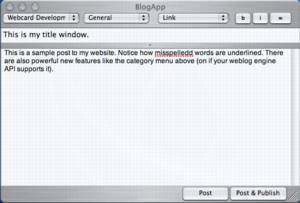 BlogApp is a Mac OS X (Jaguar Compatible only) shareware application ($6) that allows users to easily post to their weblog. No features are disabled for non registered users, but there is an insignificant dialog that occasionally reminds users that BlogApp isn't free -- in short, this is not crippled-ware. 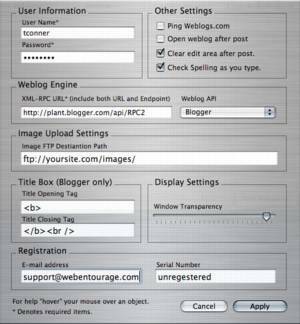 A couple of the most widely used weblog engines include Blogger, B2, and WordPress. It has unprecedented features compared to other weblog poster applications. It was designed to function on Mac OS X v10.2 or higher. It's Objective Labs's answer to BlogBuddy if your a PC person looking for a similar solution. A new Panther compatible version is in the works. The beta can be downloaded here. New title window which wraps a tag around your Blogger.com title post or if your using B2, correctly sends it in the title field. User editable drop-down list of HTML tags that is very Customizable. Store Post. Can be used to store a post in progress, or as a default template for all of your posts. Great for B2 users or folks who like to add post headings to there blogger powered sites. The first 4 words of a post are now displayed along with the post number in the edit recent post and delete recent post dialogs. This was a popular request. Spell Checking settings now remembered (if you want). Edit recent posts (up to the last 20). Drag and Drop text area. 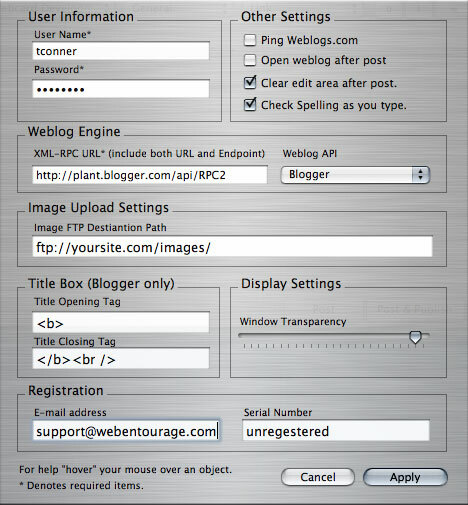 Option to automatically "Ping" weblogs.com . 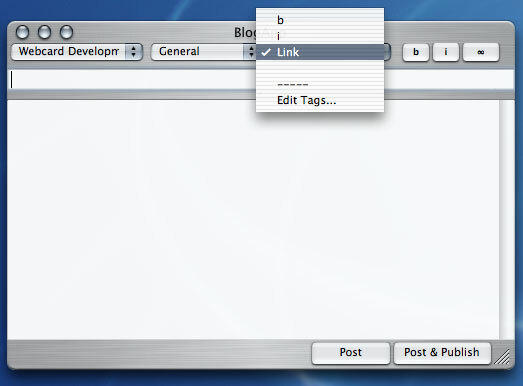 Option to automatically launch browser and visit weblog after post and publish. Will speak your post back to you if you like. Compatible with Blogger as well as any other service that supports the Blogger API. I Including Manilla, B2, and Live Journal to name a few. Don't forget Mac OS X ease of use. A Macintosh running a minimum of Mac OS X v10.2 or higher. 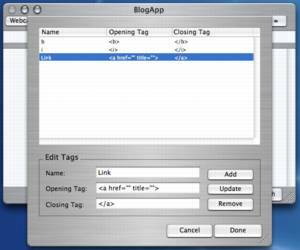 BlogApp will not function on previous version of Mac OS because if it's use of advanced XML-RPC and the AppleScript Studio developer environment. To purchase your copy of BlogApp click the PayPal button below. The price is only $6.00, and you get $5.00 free just for singing up for PayPal, the worlds #1 online purchasing source. That means for new PayPal customers it will only cost you a dollar! Your serial number will be e-mailed to the address that you register with paypal within 24 hours (usually much less). With your registration you will qualify for all future updates to BlogApp for 1 year. Also, you will receive exclusive download access to builds between public releases that add some features or tweak some issues. Decompress the disk image with Stuffit Expander. Then mount the disk image. 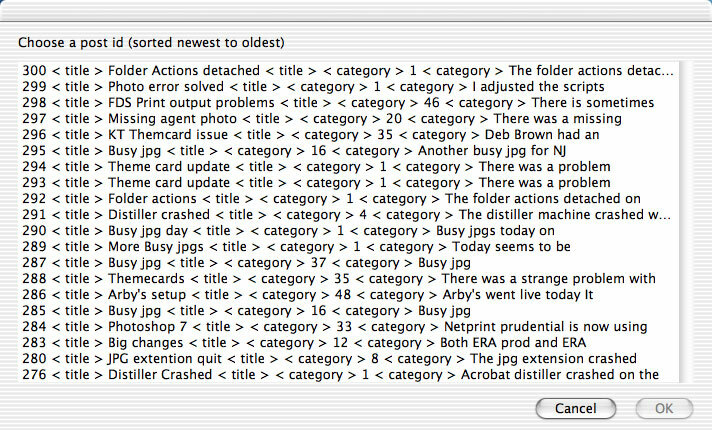 Finally, copy BlogApp to your hard drive, preferably in your Applications folder. Launch BlogApp by double clicking it. 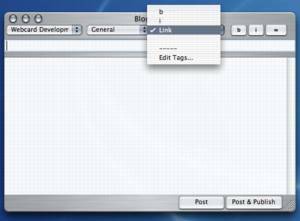 Choose the Settings option from the BlogApp menu (or press command-;) to open the configuration menu of BlogApp and enter your information. The settings area is also where you enter in your serial number, because you registered right? It is actually quite simple to use BlogApp. Once you have launched and configured BlogApp. Just start typing text into the main text area. When you are ready, click Post & Publish to post it to your weblog. Or if you want to save it for later, just click Post and your post will be stored on the server until you publish. Store post is a great new feature of BlogApp that has many uses. It's available under the File menu, or by pressing command-s. The obvious use to use it to save a post in progress. The not so obvious use is to use it as a template for all of your posts. When you choose Store post the text in the main window will be saved. 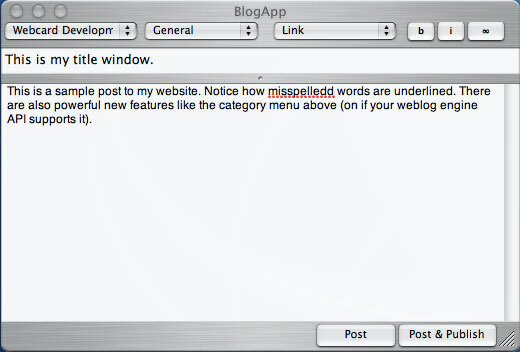 This text will be automatically entered into the text area for every new posts, or each time you launch BlogApp. So people that like to start there posts with a <h3> </h3> wrapped wound the first line of there posts can have that tag automatically there every time they start a new post. 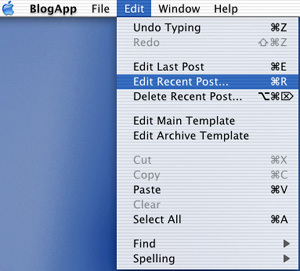 To clear out the stored text just empty the edit area and choose store post. The empty text is now the default text. I like it a lot. The more you use it the more uses you will find. The tag drop-down list is a powerful new feature. With it you can add any text that you want inserted. To edit the list choose edit list... form the right drop-down list on the BlogApp interface. A table should drop down showing the current tags and an edit area to add more tags. Click on a current tag and click remove to delete it. 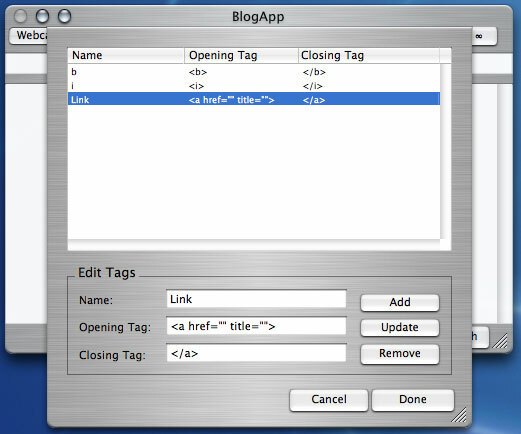 Tags only require a name and an opening tag, so you can use it to insert a signature line, a <br> tag, or anything you want. Now the tags use a smart insert technology. That means the tag is inserted wherever the cursor is or if text is selected the opining tag is placed in front of the selection, and the closing tag at the end of the selection. This is great for making words bold or making words into links. Your creativity is the limit. 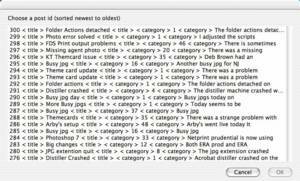 The Blogger API is prone to be down for days at a time. If you are receiving -917 error, it is likely to be down - again. The Blogger backend is having problems with edit posts. It has been down for days. Q: I found a problem with BlogApp, who do I contact? Q: When I post a main template or archive template, does it publish too? I'd like to especially thank Steve Zellers of Apple Computer, Ben Trott of Movable Type, Evan Williams of Blogger, Michel Valdrighi creator of B2, and of course Dave Winer XML-RPC and Userland software creator. Thank you all for taking the time to help. Other contributors include Rob Jorgenson, Gregory Blake, Andy Warwick, and Joe Peichel. Thanks crew!